Semi-detached house in Marina di Arbus more commonly known in Sardinian 'Gutturu de Flumini' in the Costa Verde with sea view 3 minutes walk from the sandy beach! On the first floor with about 110sqm of interior, 30m² of equipped and partially covered terrace. Beautiful garden with plants, trees and green lawn surrounding it. Independent entrance with door and bell, living room with open fireplace, table for 8 people and exit to the terrace with sea view. Kitchen with 4 burners, Corridor leading to: 1 double bedroom, 1 bedroom with 2 combinable single beds, 1 bedroom with 2 bunk beds (4 people), 1 bathroom with glass / stainless steel shower and WC, outside there is also a further shower. Wir wurden sehr herzlich empfangen und die Ausstattung der Wohnung war "first class". Jeden Tag haben wir den Sonnenuntergang von unserer großen Terasse genossen und Umberto hat uns die besten Strände in der Umgebung gezeigt. The house is a perfect place for a great holiday - situated in a quiet green area and just in front at the beach. 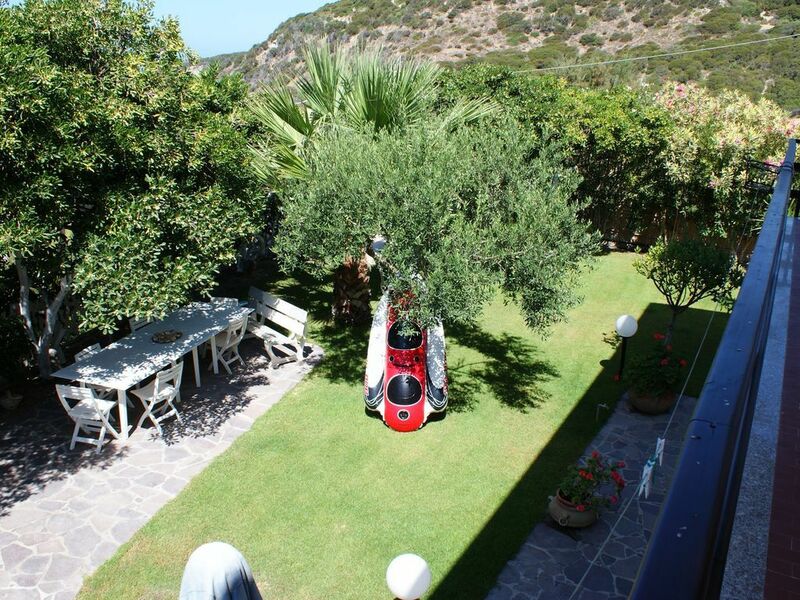 It is cleen and perfectly equipped, with two terasses, BBQ and a beautiful garden. Umberto were extremely helpful and gave us some very useful advice about places to visit and things to do during our stay. Хороший дом, в котором мы прекрасно провели две недели. Вид на море из гостиной и большого балкона, тихие спальни. Море рядом, на песочном пляже, до которого пять минут пешком, достаточно немного людей даже в высокий сезон (кроме выходных). Можно проехать на автомобиле на обширные песочные пляжи дюны Piscinas, обязательно совершить экскурсию на моторной лодке, которая отправляется почти от самого дома. Владельцы дома, семья Флорис, потрясающе гостеприимные и замечательные люди, постаравшиеся сделать всё, чтобы мы чувствовали себя как дома. Было просто прекрасно! Everything was perfect, even beyond the expectations. Marina Di Arbus has a unique charm, still an authentic spot in the Mediterranean sea! The sea is wonderful and we could enjoy every day different type of beaches all equally beautiful. Most of the main sites were just around the corner and travelling with small kids made everything very easy. The house is located just in front of the beach in a peaceful green spot with many trees and flowers. Full equipped and comfortable inside and outside. Ideal to enjoy barbecues and relaxing time sitting on the Terrace. The owners have a special kindness and touch, they made us feel home from the very first day. A special thanks goes to them, for the help, the smiles and the suggestions which made our stay absolutely perfect. Un abbraccio a voi ! !